We loved to design that’s best for your scheme. We are type of designer to help you to be able you to determine what kind of swimming pool would be working at its best depending on your space. We can work with you to design the best 3-D pool in your home. It is the pride of D.PANETTA CONTRACTING to carefully inspect yard for accurate layout and create a very distinctive 3-D pool design for clients. Creative plans, layout and the best designs are very important to us. We consider also the reason and main purpose of you for having swimming pool built and we do our best work to suit your taste whether it is for recreation, relaxation, therapy or gatherings. In addition to selecting and creating the best designs, our designers at D. Panetta Contracting will assess and give recommendation for additional features that you might like with your swimming pool. When it regards to location we at D. Panetta Contracting can also give you advice wherever you think it is suitable the pool could and give you our inputs. We can also look at the area in questions and decide if what you have chosen is feasible or could work with our design. We will look at your yard and your home because building a swimming pool is not task where you just build the pool, it has to be built in a magnificent way that it also enhances your overall pool yard. We give concerned and dedication into creating designed landscapes and pools to every of our clients. With over a long period of experience in 3-D pool and landscape design we guarantee to help you achieve your ultimate pool for your family and friends to enjoy. We also guarantee a full client satisfaction and we ensure you that the quality of our work and warranties are above all the rest. Take responsible to have design that would best fit your scheme. 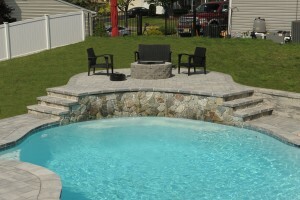 Our pool designer will be able to help you determine what type of pool would be suited in the space available you have. They can work together with you on your ideal design. 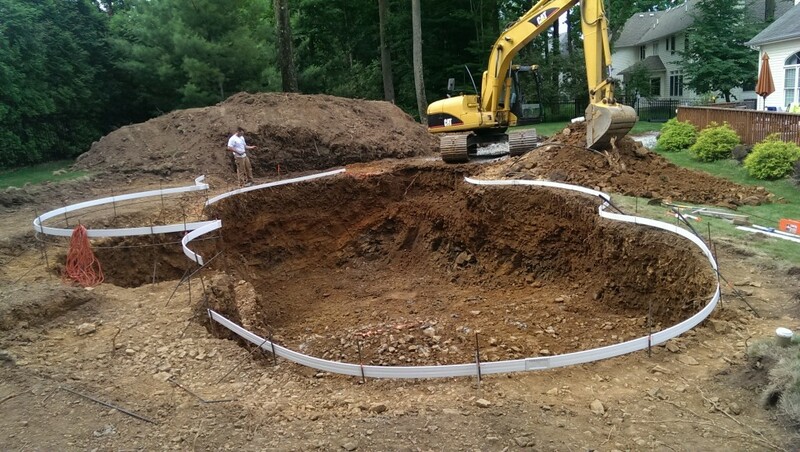 We carefully inspect such the yard layout to determine the design that will be part of your pool. If the layout is flexible, then you can have more options for what kind of pool you are wishing for. If not, you may be limited to a few designs but we would be very glad to try our best to work with stunning design of pools capes. 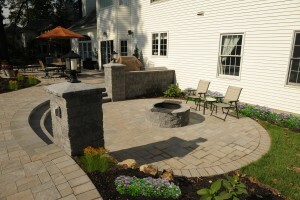 D. Panetta Contracting will bring you instant reconstruction and hard scapes of surroundings with walkways and patios. We are proud to say that we have been in the hard landscaping or hardscapes business for a number of years now. Over a period of time, we have gain a certain level of integrity in craftsmanship for hardscapes that is made in a unique way in this kind industry. We have acquired many certifications, as well as un- refutable reputation as we are skill full and respected by people who have worked with us to become their contractors. We give thorough and attentive service to our customer’s wishes and right under their budget. As hardscape Contractors, D. Panetta Contracting takes the time necessary to listen and meticulously plan with the attention customer. On the jobsite, we do not cut corners but we install with a level of integrity with the commitment for the industry. In addition, a good part of our work is not only found by word of mouth and we work hard instead of just having good advertisement; our goal is the perfection of work. If you will let our staff of professional Landscape Architects survey your property and suggest improvements to your site then your property have the big chance of becoming a beautiful paver patio, walkway, or a stone retaining wall. A call can make it happen! D. Panetta Contracting gives priority on your investment; the emphasis is place on technical and more creative skills. Design projects are carefully focused for landscaping development. The design and build projects emphasizes in design theory, process, graphic communications using either traditional or digital tools, methods and materials of construction which also includes project layout and site surveying. When it comes to landscape design, construction and improvement project D. Panetta Contracting will make sure that there are plans in place whatever designs the landowner preferred. We dedicate ourselves to look at area in question and lay your vision for improvement down on paper. We consider the square footage you have available. If you are considering adding new plants, trees or shrubs then consider which species will survive best in your climate and soil conditions. D. Panetta Contracting is working professionals for landscapes on a big project with a good idea are to ensure that it is completely properly. If you choose to work with us, we can help even if you are adding water features, outdoor lighting, a deck, new patio or interlocking brick you should have a realistic plan in place before you start your backyard landscaping project. Backyard landscaping project there are so many tips out there that it can be difficult to know where to start. The depth of your project will really depend on how much work you need to do. The amount of work you have to do and the types of changes you want to implement really will determine whether you should hire professionals like a landscape architect or a landscape construction company or if you can try to do the work yourself. If you are working with stone, flagstone patios, interlocking brick or interlocking pavers then your project has probably gone over the line from a do-it- yourself project to the kind where you should hire a professional. In order to lay stone and brick properly in a way that will last over. If you are planning to have your own home patios then do not worry here at D. Panetta Contracting we will help you build a very beautiful and amazing patio for your home. We will send you our professional designers and builders to take care of your project needs. It does not matter if it is a small project or a large project, we will help you build your dream patio. Patios are already traditionally built for recreation and area of relaxation purposes. It is actually positioned close to the main building while they are generally detached and without roofing. Newer models can be attached to the house or building and have roofing built for an all-weather construction. Most like patios becomes more usable during celebrations such: anniversaries, parties, wedding receptions, outdoor meetings, and many more. There can be many options among patios but it is based on your preference and space available. Wood patios and decks, Brick or stone patios, Patio enclosures, Asphalt patios and any other kind are some example of patios we can build for you. Here on us, you will not find a good professional contractor, and meet our outstanding skilled builders that not only working but are very eager to install, repair or design your patios. If you will give us the opportunity to give our service to you then possibly then purposes of making patios will be successful. Designs have taken on a whole new dimension, making them sought-after outdoor structures and served to its purposes. We, D. Panetta Contracting we understand that your walkways are considered as one of the most precious assets that is very important in your home. We build good and beautiful walkways, finished to surely enhance your home’s curb design and especially we can provide comfortable way for people to use as walkways. If you wanted to have good looking walkway we know how to build from beautiful designs. We followed walkways standard rules for the good of walkway project. If you have questions about the standard rule that we followed then they are: The good choice of paving materials. This can take not only be applied for a walkway to beautify or enhance the walkway but the quality materials for paving must be chosen greatly as it should be durable and can last longer as this will be an extension of outdoor living and part of garden, patios and landscape. D. Panetta Contracting always goes into uncluttered and fitted walkway will add value to home. Finally the most important in our standard is the people who are working with us! They are our Professionals who will be responsible for needs in your walkways. We at D. Panetta Contracting acknowledges that working for Pavers, travertine, flagstone concrete, stone masonry requires a specialized set of skills that is both feasible and artistic at the same time. Our works at D. Panetta Contracting are very high quality and have higher value of the project. We help you to choose the best styles and paver materials that fit your style and budget. Since we do different projects and designs we freely provide you time for further on sites inspections and give you price estimates although we are not the least expensive paver contractor in the industry, but we believe ourprices accurately reflect the value of our work and the high quality of work can be received to every of the clients. D. Panetta Contracting is very highly reputable company that is creating scenic walkways in beautiful backyard gardens patios and other paver constructions for years. We consider the variety of hues and textures for unlimited possibilities to both complement and enhance the beauty of any surrounding, and also we make sure that the projects can become environmentally friendly with mother earth. From palatial outdoor entertaining areas to pool decks with a relaxing spa-like feel, you can count on our unsurpassed strength and flexibility. One of the best pavers most of us build that is durable and affordable is our Concrete pavers can withstand the forces of weather, water and traffic. Plus, they are especially designed to withstand freeze-thaw conditions, making them a good choice for cool as well as warm climates. D. Panetta Contracting has accomplished numbers of good retaining walls structures projects. We make sure those retaining walls could deal in preventing erosion and collapses of higher level ground onto a certain building structure or general area. We were very accessible in case you will need us. We will go to show you our attractive retaining wall that’s firm, solid and will stand the test of time. It features a solid base, compacted base material and good drainage. Walls look great from the front, too, and will enhance the look of your yard. We make sure a strong wall features well-compacted base material, compacted materials in front of the wall to prevent kick-out, and stepped-back materials. D. Panetta Contracting provides solid products for solid systems for retaining walls products block fencing and patio walls and gives opportunities for you to choose the best style. As one of the very top company in the industry, we do our best to develop our expertise, the use of tools including training programs to help build contractors knowledge and will be given enough resources that is necessary in every project. We have advance technology for more building into a flexible way. Our work like flexible structures with interlocking dry-stacked materials provides superior performance over rigid construction techniques. D. Panetta Contracting is always here ready to help you into creating perfect outdoor kitchens and barbecue place to give you an entertaining space for your culinary adventure at home that is very ideal extraordinary. Our aim here is to make you feel confident on your new built outdoor kitchen and barbecue outdoor area. We are very selective when it comes to the use of top quality products. D. Panetta Contracting only uses top-quality outdoor kitchen materials and appliances to suit both your style and your budget. We take outdoor barbecues basics to the advanced so it will be more entertaining and more exiting to make barbecue outdoors and also you will grill in style. Because we take the ultimate backyard grilling beyond the basics, so you’ll enjoy entertaining outdoors in convenience and in style. With your own outdoor kitchen and barbecue, you can cook outside along with your favourite chef or you yourself the chef. Invite friends and family at your house to enjoy weekend outdoors and have the chance to gather for barbecue grill, good food and enjoy the relaxing view in the pool and backyard landscapes without getting bored. It is just a very different experience in your life. When D. Panetta Contracting design outdoor kitchen, it is assured that they put all out heart and expertise on working on it to give you cool kind of kitchen you’ve always wanted. Just imagine if you have spectacular one of a kind luxury outdoor entertainment like outdoor kitchen and barbecues. The concepts and styles have earned great reputation and respect from our past clients because we build high-quality outdoor kitchen made by the ability of our contractors by crafting distinctive designs for our customers. D. Panetta Contracting is a reputable company when it comes to general renovation either in your kitchen, rooms, working space or anywhere the client likes. Our duty is to share and give our outmost expertise and craftsmanship towards the renovation. We are happy to create a more beautiful space that you everyone will enjoy. Through our experience, expertise and studies we can guarantee to build unique sophisticated designs. We believe that we could bring you great living space that can transform your lifestyle. In your first consultation through design, construction and beyond, your needs, your concerns and your vision are always our most important consideration for us. If you are always dreaming or imagining a new kind of space you wanted to be built, then confidently you could let our design and build team bring a new life on your dream place. Whatever purpose you have for you to decide for your renovation either it is for reconstruction, beautification or just wanted to change the look of the theme of your residence or commercial building, whether it be a rustic, transitional, modern or contemporary concept. With the dedication and perseverance of our team we guarantee we could transform your space into an exceptional place that surely enhances the level of your life style. Home Water features transform an ordinary landscape into a delightful retreat. Whether you seek something more relaxed like a calm stream, or a little more excitement with a rushing waterfall, D. Panetta Contracting can do anything that your heart desires. D. Panetta Contracting offers a number of different possibilities to choose from. We can accommodate any spot in the yard and build it any size. In fact, depending on the design, a water feature is excellent for solving landscape design issues such as a slope that you are not sure what to do with, a shady area where your sods won’t grow, a rocky terrain, etc. 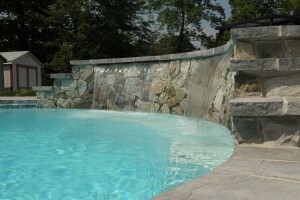 Our designed landscape waterfall features are of the best built and feature in your home or business building grounds. Whether it is a commercial or even residential area we at D.PANETTA CONTRACTING will surely build a majestic waterfall feature that your visitors and family can enjoy. A home waterfall feature accentuates the beauty of your garden. It also makes everyone relaxed mesmerized and calm because of the beautiful garden nature that we at D.PANETTA CONTRACTING can create. We love to enjoy a good grill, good company, parties at home, or even just an evening or weekend rest and relaxation. Ponds at your garden could be one thing you should always consider in your garden and landscape design. D.PANETTA CONTRACTING contracting has been doing ponds from design to landscaping. We can create the most outstanding and most beautiful ponds you can imagine. Building a garden or backyard Pond will always be a good thing to enjoy and enhance the garden at your home and also bring tranquility to your surroundings. We at D.PANETTA CONTRACTING understand the complexity and the need of every home owners or even business owners to enhance their outdoor living environment. Thus we put in heart the reason and the purpose of our designs and builds and that is to satisfy and give calmness to all our clients and make sure that they get what they are dreaming of. 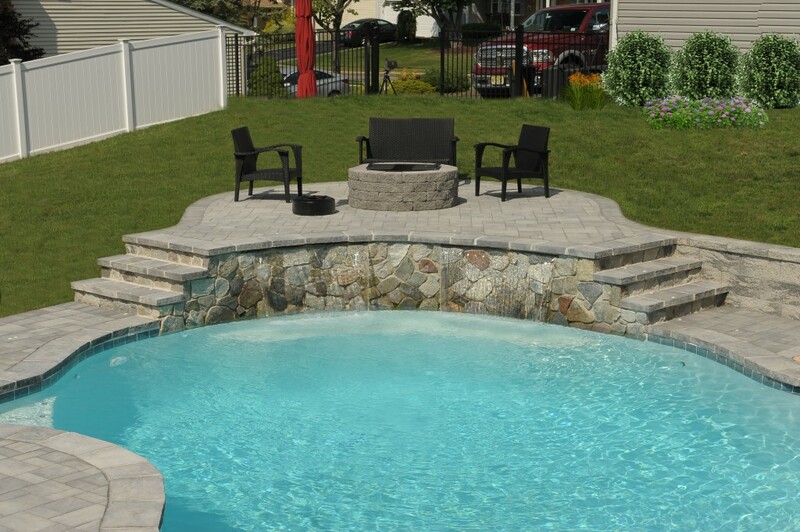 A garden, a walkway or even a backyard pool will never be complete without the steps added to it. So what it is exactly? Steps and walkways are what welcomes you and your guests at home and building, designing and using very high quality materials is what defines your steps from the rest. D. Panetta Contracting has been designing and building steps over the years. We have the best contractors, designers and builders that will guarantee the satisfaction of all clients. 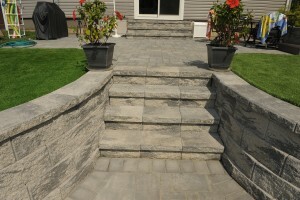 We at D.PANETTA CONTRACTING will build the steps and walkways that every homeowner desires for. And we will handle everything and make sure that you guests will all be in awe every time they visit your home. Do you love the outdoors? Do you love bon fires? Do you love camping? Do you love a good outdoor grill and outdoor parties with friends? You don’t need to get too far as you can do it at the comfort of your own garden and backyard. What else you can add and build on to enhance the outdoor living experience, which is to build fire pits perfect for family and social gatherings. Fire pits is now one of the most sought after landscape feature. D.PANETTA CONTRACTING has and can design the perfect fire pits that will definitely enhance the looks and features of your garden. D. Panetta Contracting is dedicated to its service. We want perfection, durability and beauty in all our work. We will guarantee that your garden and outdoor experience will never be the same. D.PANETTA CONTRACTING specializes in different and exquisite designs and builds of all kinds and variations of Pavilion. Aside from Pavilion D.PANETTA CONTRACTING also implements harmony within its designs, incorporating all aspects of a beautiful outdoor or garden, and highlighting them with all sorts of features and amenities that you would think that only on first class resorts and houses can be made. There are a number of different landscaping ideas and one of these ideas is the ornamental landscaping method or plan. Basically ornamental landscaping focuses primarily in the use of ornamental plants, flowers, orchids, herbs and even some vegetables where their true feature is also decorative and beautifies the garden and home. It is a very delicate landscape idea because the arrangements of the ornaments, the flowers and houseplants must all be in harmony to one another. That is the most difficult task for any landscaping project that involves a variety of ornamental plants and houseplants. D.PANETTA CONTRACTING ornamental landscape designs are very eye pleasing, calming and above all the overall landscape build complements all the features of the house. Ornamental landscaping is both functional and decorative feature. D.PANETTA CONTRACTING uses all its unique skills and ability to deliver an outstanding, very pleasing and very satisfying ornamental landscape at your home and businesses. Add pool houses and gazebos to your pool landscapes and or garden. But gazebos can also be an added feature on the pool sides. These are a couple of brilliant ideas for improvementin your home. If you have a pool then you must also have a place to rest, eat, drink and enjoy a good bonding with family and friends. Pools houses are just a very basic feature for every home that has swimming pools. Gazebos on the other hand are perfect shelter outdoors in your garden, backyards or lawns. Gazebos are very popular to all home owners because it gives them shade whenever they want to spend the day outside their house and enjoy the fresh air and view of their landscape and garden. If you want to build a very promising and majestic pool houses and gazebos, then D.PANETTA CONTRACTING is the answer. D.PANETTA CONTRACTING has been designing and building pool houses and gazebos for years. They design the pools houses and gazebos very in genuinely that they complement your landscapes, plants gardens other features like the grottos and waterfalls. The build is of very top quality, because at D.PANETTA CONTRACTING they thrive for perfection with style. Do you want to add an extra improvement to your house, office or even at a restaurant and enhance it visually especially at evening? Then the answer is with the installation of exterior lightings. Exterior or outdoor lightings however should not just be added or installed on the spot. Adding exterior lighting to your residence or commercial establishment must also have a plan. What is the layout, the types of lighting, the shades, color and more must be considered when thinking of adding exterior lighting to any residential or commercial infrastructure. The lighting must not only enhance the appearance of a house at night but the purpose is also to provide a guide and light. It is a perfect complement for your front yard, garage, pools sides, garden and backyard. D.PANETTA CONTRACTING is an expert in exterior lighting design, layout and installation. Their designers have years of experience and their skills are top notch that they can complement the exterior lighting to the overall appearance of your home or business. D.PANETTA CONTRACTING will surely enhance the visual presentation of your home at night and you will never regret of having to install exterior lighting in your home. Grottos are definitely a very unique feature that any home owners needs to add to their house either in the backyard or the garden. The Grottos will surely enhance the landscape project, ponds, home waterfalls and other garden features. D. Panetta Contracting has been designing and building grottos for decades and guarantees that all the clients are very satisfied with the results of the work. D.PANETTA implements state of the art and modern day methods, designs and features for grottos. With lots of different designs and even custom designs the company can definitely handle it. Their designers and contractors are very skilled. D.PANETTA CONTRACTING do not just design the grotto but they make sure that the design complements all elements in your garden, backyard, poolside or wherever you want the grotto to be built. In every house, offices, buildings, restaurants and all kinds of establishments either residential or commercial it needs water and sewer lines installed. The water lines are of course the one that will deliver and supply the water to the whole house for use of its residents; for bath, cleaning, cooking and much more. Water is the life of every household and offices that is how important it is. The sewer lines are for drainage and sewage waste disposal from use of water and other means. D. Panetta Contracting is an expert in detailed and efficient layout and installation of all types of water and sewer lines. Wherever it is needed it is very important that both the water and sewage lines are installed. D.PANETTA CONTRACTING only uses high quality pipes and drainage materials to ensure that your water is delivered clean and sewage is going out to the drain efficiently with no mess. The company focuses on delivering true service and work for its clients. If you ever needed excavation laying out the ground work for your house, offices, building compounds and other pre-construction work, D. Panetta Contracting will definitely do the job and fast. D.PANETTA CONTRACTING has extensive experience, machineries, equipments and hard working personnel to meet the demands. The level of quality of our ground work is very high; we work fast because we know that as soon as the ground work is ready the next phase of construction and work can proceed. All work are started with careful planning, layout and delegation of work in order for the project to progress smoothly. D.PANETTA CONTRACTING uses state of the art equipments, machines and surveying equipments. Our personnel and managers are on round the clock supervision to ensure that the work is done not just fast but very detailed and careful. We make sure that we meet the client’s expectations and more than what we really offer. This might be new to hear but there is an architecture and building feature you might want to add in your house and offices, this is Belgium Block Curbing. D.PANETTA CONTRACTING has been designing and constructing Belgium Block buildings for decades. So what it is exactly? Belgium block curbing uses stones, granites and such in building driveways, pathways and walkways. It is a method of creating walkways that are curbed. The stones and masonry’s installed are delicately and accurately placed creating a very beautiful blocks for walkways, pathways, driveways and steps. This is sort of the edges blocks of any pathways and can be designed where plants can be planted for a more scenic and neat view of the pathways. D. Panetta Contracting is there to help create and install those beautiful Belgium block curbs that you most often take for granted but actually needed when you want a real complete landscape and pathways. D. Panetta Contracting is located in Randolph, NJ and serve all of Northern NJ, Morris County, Mendham, Randolph, Parsippany, Denville, Morris Plains, Morristown, Chester, Bergen County, Short Hills, Long Valley and the surrounding areas. D. Panetta Wins Best of House and Home 2016!